“Oye chica! Tenga aca. Te invitamos!” Someone was calling to me as I walked by a makeshift tent on the side of the street in Oaxaca’s old center. Curious, I joined the speaker, a young Mexican man, as well as a few others, underneath their tent. They had set up a large folding table which, upon closer examination, I found covered with radishes of all shapes and sizes. “Tomas,” said the man, whom I later learned was named Luciano, as he handed me a razor blade and indicated that I was to choose a radish from the heaping pile. As I carefully selected the perfect radish, the rest of the table contentedly shaved, carved, dismantled and reassembled their own radishes into a variety of different shapes and figures. If I had come upon this scene a few days before, the request might have seemed a bit odd. However, the previous day on my tour of the sights surrounding Oaxaca, my guide had informed me of my great luck in arriving in Oaxaca just in time for their annual Noche De Los Rábanos (Night of the Radishes) festival. I had never heard of this festival before, but I was one of those kids that made words in my alphabet soup and drew smiles on my pancakes with whipped cream, so naturally I was intrigued by the idea of creating art out of food. I ventured into the Zócalo on December 23 (the date the festival has been celebrated since its inception in 1897) to see exactly what made this festival so famous. Even in the early afternoon, the main plaza was so full of onlookers that it was difficult to move. The smell of tamales, chile, popcorn and cotton candy lingered in the air and reminded me of the many times I visited the New Mexico State Fair with my family. Vendors called elote and nieve in singsong voices, and children danced to music emanating from the many different portable speaker systems as happy families shared homemade picnics. While I strategized how to get a better view of the exhibition stalls, an older gentleman motioned for me to take a seat next to his family. “Quieres?” he asked, and offered me a chicken taco. “Feliz Navidad,” he said with a toothless grin. I then asked him why so many people come to Oaxaca every year specifically for this festival. “It is important to celebrate our history and our art,” he explained. “It is a time for us to come together and be thankful.” Despite me asking, I never did not get a “historical” explanation about the origins of Noche De Los Rábanos from any person that I asked about the festival; it was obvious that the most important thing to these locals was spending time together and sharing in the appreciation of Mexican creativity. And the joy was tangible. Noche De Los Rábanos was first celebrated in 1897 in Oaxaca’s “zócalo” (main plaza). Originally, radish farmers, with an overabundance of radishes from the harvest, decided to create art out of the excess crop in order to generate more radish sales. However, this activity quickly grew in popularity. 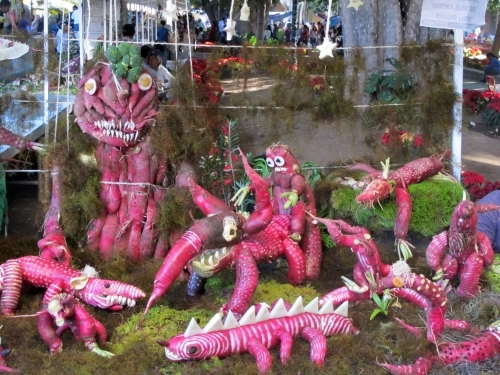 Since then, annually on the morning of December 23, artisans from all over Oaxaca converge on the zócalo and spend all day constructing intricate scenes made of these large red radishes. These radishes, grown especially for this event, can weigh up to 3 kilograms and grow to lengths up to 50 centimeters. They are left in the ground for months after the normal harvests so that they are able to attain their giant size and strange shapes. The artist whose creation is named best in show gets their picture in the local paper. I struggled through the crowd to try and get a better look at the different stands, and as I proceeded I felt hands pushing me forward. My fellow neighbors were moving out of the way to make sure I was able to see. “Veas!” they said, pointing out sights they wanted me to see. Suddenly, I was transformed from a mere visitor in a foreign country into a nominal member of one enormous family. As I moved from one stand to the next, I found myself casually placing my hand on my neighbor’s shoulder to steady my tip-toed stance. We all smiled in response, and I realized how many times in New York I had stood in close quarters with my fellow New Yorkers, actively trying to avoid physical contact. In Mexico, personal space has another purpose: its breach, rather than an offense, signifies friendship, comradery and acceptance. I moved along with the wave of people, and each stand was more impressive than the last — an amazing representation of the creativity, beauty and history of Mexico. The artists, I learned, are mostly radish farmers turned professional craftsmen and aficionados. The scenes cover an array of topics from the nativity, to models of saints and famous figures, to fiestas, to the flora and fauna of Mexico. 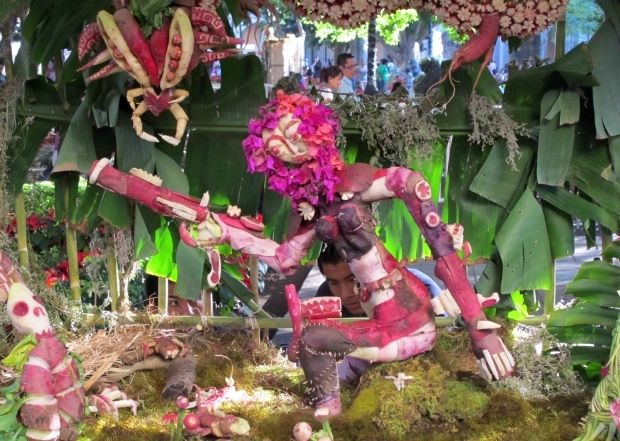 While the main artistic features are made of radishes, these scenes include other materials such as dried flowers and corn husks. “Ah, un delfin!”, Luciano said to me approvingly, looking over my shoulder as I attached the fins to my radish-turned dolphin. As we spent the next hour admiring each others’ creations, my fellow artists asked me about my experiences in Mexico, how I was enjoying Oaxaca and what it was like to live in New York City. We conversed like old friends, Luciano poking fun at my dolphin’s lopsided tail, another comparing his hand-like creation to that of a witch. It made no difference that I was a single girl traveling alone, that my Spanish was not perfect, nor that prior to that day I had no idea that Noche De Los Rábanos even existed. After I visited all of the different Rábanos scenes, I wandered back towards my apartment through Oaxaca’s main thoroughfare. People smiled and exchanged Feliz Navidads, and gasped with excitement when fireworks streaked the sky with radiant blues, pinks and oranges. 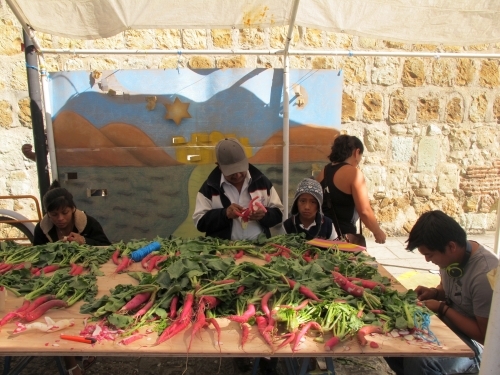 As I left the main street behind, I passed by the now deserted tent where we had earlier created our own radish art. Someone has arranged all of our creations into one beautifully chaotic diorama. Even though our scene had no specific theme (we had created everything from animals to cars to abstract figures), to me it was the most powerful scene of all because it represented the beauty that is created through acceptance and friendship. I smiled, thinking to myself how Noche De Los Rábanos is much more than just an art festival. It is a true expression of the Mexican persona: open, accepting, generous and full of joy. 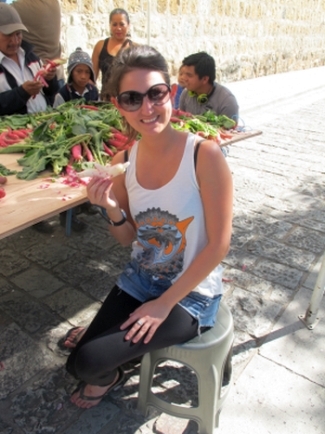 Chelsea Perino is an avid traveler and has visited over 60 countries, mostly as a solo female. Chelsea recently graduated with a Master’s Degree in Public and Organizational Relations and is now a freelance Public Relations and Marketing consultant and writer in New York City. She is the Co-Founder of her own online lifestyle magazine DIY-NYC.com.